I was born and raised in Kingston, ON, but spent childhood summers on Grand Manan Island where I have lived full time since 2007. Prior to moving east, I worked in administration at Queen’s University for 16 years (3 years in the School of Industrial Relations and 13 years in the Department of Psychology). With a BA in English Literature from Mount Allison, a BFA from NSCAD, and a BED from UNB Fredericton, I am presently a part-time high school teacher and the Curator/Director of the Grand Manan Museum. Cohabitating in a tall house overlooking Whale Cove with my poet husband, Wayne Clifford, two black cats and a wire-haired pointing griffon dog, I find that daily beachcombing walks, ocean vistas, rugged cliffs, and summer gardens are ongoing sources of artistic inspiration. My photography, paintings and ink drawings have been exhibited in libraries, museums and art galleries in Kingston, Halifax, Hampton, St. Andrews, Saint John, and on Grand Manan. 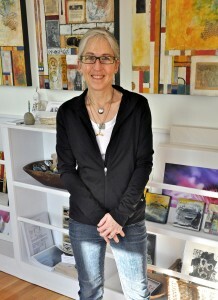 You can see my work in person at my Rocky Corner Studio on Grand Manan in the Bay of Fundy, New Brunswick, Canada. Begun as a portfolio exercise, many of my ink drawings are strongly intuitive and spontaneous. I think of these as “follow-the-line” drawings. They contain elements which tell mythic stories, deal with relationships, or look at the natural world—sometimes at a cellular level—using a visual language which is abstracted, pattern-based, metaphoric, and universally symbolic. Some other ink drawings draw their inspiration from my photographs and are abstracted and patterned translations and transformations of them. Sometimes the two intersect and inform each other. A series of ink drawings (Peg Leg Ink Drawings) were commissioned for a book of my husband’s poetry, Learning to Dance with a Peg Leg: Three Dozen Tunes for a Third Mate, Wayne Clifford, Frog Hollow Press, 2009. My photographic practice began in 1998 and lead me in 2004 to pursue a degree in Fine Arts at NSCAD University (formerly The Nova Scotia College of Art and Design). Before attending NSCAD I was involved with the Kingston Photographic Club, a member of CAPA (Canadian Association of Photographic Arts). My practice ranges from 35 mm to medium and large format, medium format pinhole, infrared and digital photography. In the history of photography there are many branches of practice which interest me, too many to enumerate, but my own practice follows a number of them and continues to expand and evolve. Some of these include: macro photography and the possibilities for creativity, patterning, texture, and abstraction that it presents; the iconic photographic image as first explored by the photographers of the 1920-1930 era; the documentation of people and places; processes of decay; the interaction and impact of people with and on their environment; collections and their relationship to memory, nostalgia, and the creation of meaning and identity; and digital montage. I paint in acrylic, with bead work and mixed media collage, in oils, and in beeswax encaustic on wood. My painting interests extend to nature-based abstraction, patterning, automatic line drawings, surreal narratives, mixed-media, and still lives. Because of my interest in textiles, I sometimes make paintings which use thread, buttons, beads, and other textile-related materials. These are usually sewn on to the canvas. The interplay between the painted and the sewn surfaces creates a tactile-rich surface which I enjoy. My most recent painting explorations have led me to the use of encaustic as a painting medium. Beeswax encaustic paintings (beeswax, damar varnish and pigment) are luminous, aromatic, and have wonderful layering, collaging and sculptural possibilities. There are a number of themes which I continue to explore through encaustic painting: playful, colourful line drawings inspired by the jetsam and flotsam of the Bay of Fundy tides on the beaches of Grand Manan; nature-based abstractions inspired by the Island’s geological formations; mixed-media collages which explore its cultural, natural and personal histories; pattern-based textile-inspired compositions; and those which incorporate my own or historic photographs in my collection and photo transfers.